One of the most obvious changes in Data Vault 2.0 is the introduction of hash keys in the model. These hash keys are mandatory because of the many advantages. Hash keys do not only speed up the loading process; they also ensure that the enterprise data warehouse can span across multiple environments: on-premise databases, Hadoop clusters and cloud storage. Let’s discuss the performance gain first: to increase the loading procedures, dependencies in the loading process have to be minimized or even eliminated. Back in Data Vault 1.0 sequence numbers were used to identify a business entity and that had to include dependencies during the loading process as a consequence. These dependencies have slowed down the load process what is especially an issue in real-time-feeds. Hubs had to be loaded first before the load process of the satellites and links could start. The intention is to break these dependency by using the hash keys instead of sequence numbers as the primary key. In advance, business keys may be a sequence number created by a single source system, e.g. the customer number. But, business keys can also be a composite key to uniquely identify a business entity, e.g. a flight in the aviation industry is identified by the flight number and the date because the flight number will be reused every day. In general: a business key is the natural key used by the business to identify a business object. While using the business keys in Data Vault might be an option, it is actually a slow one, using a lot of storage (even more than hash keys). Especially in links and their dependent satellites, many composite business keys are required to identify the relationship or transaction / event in a link – and to describe it in the satellite. This would require a lot of storage and slow down the loading process because not all database engines have the capability to execute efficient joins on variable length business keys. On the other hand we would have too many columns in the link, because every business key must be a part of the link. The issue at this point is that we also have different data types with different lengths in the links. This issue is exaggerated because it is also required to replicate the business keys into their satellites. To guarantee a consistent join performance, the solution is to combine the business keys into a single column value by using hash functions to calculate a unique representation of a business object. Due to the independence during the load process of hubs, links and satellites, it is possible to do that all in parallel. 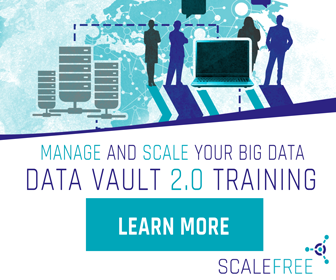 When Dan Linstedt, co-founder of Scalefree, invented the Data Vault, he had several goals in mind. One of the goals was to load data as fast as possible from the source into a data warehouse model, process it into information and present it to the business analyst in any desired target structure. Satellites: descriptive data, that describe the parent (business key or relationship) from a specific context, versioned over time. Now, as we always teach (and sometimes preach): you can model all enterprise data using these three entity types alone. However, a model using only these entity types would have multiple disadvantages. Many complex joins, storage consumption, ingestion performance and missed opportunities for virtualization.